A Canadian historian with expertise in religion, ethnicity, migration and rural sustainable development in the British Atlantic will bring a message of problem-solving with “science diplomacy” to MTSU Thursday, April 4, for this spring’s free Strickland Visiting Scholar Lecture. Dr. S. Karly Kehoe, the Canada Research Chair in Atlantic Canada Communities at Saint Mary’s University in Halifax, Nova Scotia, will explore how learning from history can help find global solutions for challenges as wide-ranging as mass displacement, newcomer integration and research security. She’ll speak at 6:30 p.m. April 4 in the State Farm Lecture Hall in MTSU’s Business and Aerospace Building, Room BAS S-102. A 5:30 p.m. reception in the foyer outside the lecture hall will precede Kehoe’s talk. A campus map is available at http://tinyurl.com/MTParkingMap. Kehoe, a native of Cape Breton, Nova Scotia, also is an associate professor in Saint Mary’s Department of History. She earned her Bachelor of Arts with honors from Saint Mary’s and her doctorate in history at Scotland’s University of Glasgow. She is also a member of both the Global Young Academy and the Young Academy of Scotland and is a fellow of the Royal Historical Society. Kehoe served as a lecturer with the Centre for History at the University of the Highlands and Islands and as a senior lecturer in history at Glasgow Caledonian University before returning to Canada to her alma mater to teach. She’s also the author or co-editor of multiple books, including “Creating a Scottish Church: Catholicism, Gender and Ethnicity in Nineteenth-Century Scotland” and the “Histories of the Scottish North Atlantic” book series. “Science diplomacy,” which often involves academic, technical or research-based exchanges, encourages nations to use scientific collaborations to create international partnerships and find answers to common problems. During her MTSU lecture, Kehoe will demonstrate how her research on historical migrations is linking up with other young academicians’ work worldwide to create an interdisciplinary lens to understand and develop sustainable solutions for challenges posed by migration. 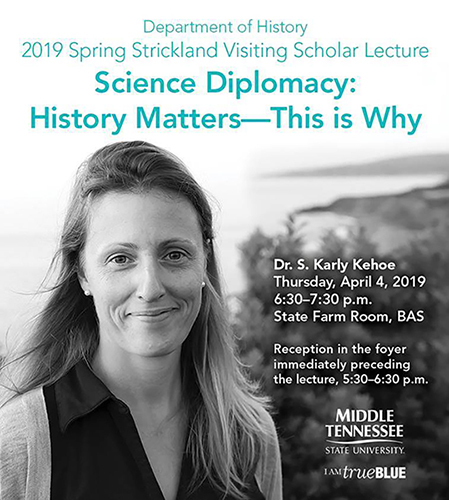 MTSU’s Department of History is the Strickland Lecture series sponsor. 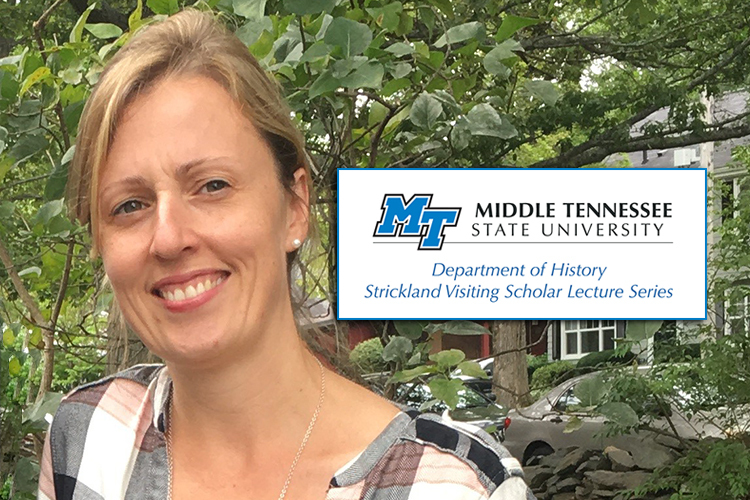 The Strickland Visiting Scholar program allows MTSU students to meet with renowned scholars whose expertise spans a variety of historical issues. The Strickland family established the program in memory of Roscoe Lee Strickland Jr., a longtime professor of European history at MTSU and the first president of the university’s Faculty Senate. For more information about this Strickland Visiting Scholar Lecture, please contact MTSU’s Department of History at 615-898-5798 or visit www.mtsu.edu/history.